LAKELAND, Fla. — With their teeth, their tails, and their daunting reputation — you wouldn’t think an alligator would need saving. But, one Florida man says alligators and other large wildlife are in grave danger. 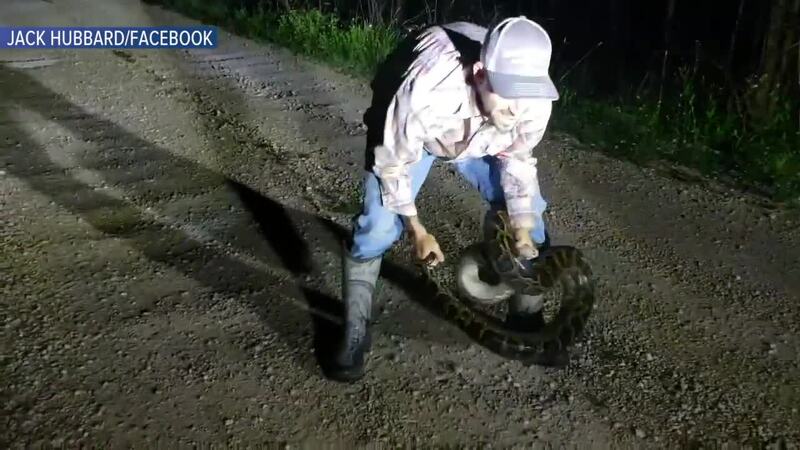 “They are eating everything they come across” Jack Hubbard, who went on his first Python hunting trip this past weekend, said. Photos from Jack Hubbard show an eight-foot slithery python gripping onto a man's arms after the big catch. This is one example of what lurks beneath the grass and has the ability to harm or even kill an alligator and other prey. “It’s just an ecological disaster down there because of it," Hubbard said. 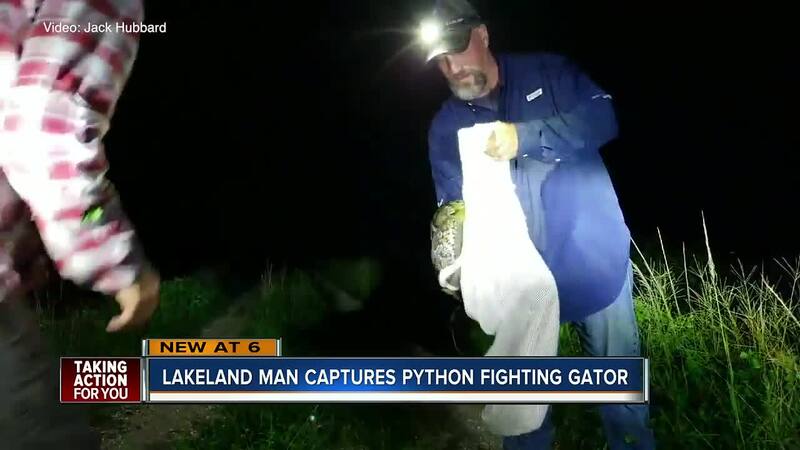 This python was found strangling a gator as Mike Kimmel grabbed the snake barehanded and Jack Hubbard, from Lakeland, caught it all on camera. It has become such a problem - the state of Florida is funding the Python Elimination Program . According to the South Florida Water Management District, about 99 percent of the fur animals have been reduced, forcing large prey and the pythons to look for food elsewhere. “So not only are the snakes on the move, the panthers, the coyotes, the bobcats they are all moving out to residential areas.” Hubbard said. The program, which has been in the works since 2017 has given out about $200,000 to hunters and has netted about 1,075 pythons. The South Florida Water Management District is spearheading the program, taking aggressive action to protect the Everglades. According to Hubbard, hunters are out in the Everglades each day, driving for hours on end to spot and catch pythons from public land. The program offers incentives to hunters who kill the snakes, which have become extreme predators in the Everglades. For the first four feet, hunters receive $50 per foot, and then another $25 per foot after that. The snake caught on video, is worth about $150 dollars.